In wake of the erstwhile scheme, and Project/Infrastructure Development for Destination and Circuits (PIDDC) – of Ministry of Tourism getting delinked with effect from financial year 2015-16, Chief Minister Pema Khandu took up the matter for the Center to help Arunachal Pradesh tide over pending liabilities under the said scheme through a one-time assistance. It may be noted that some ongoing infrastructure projects in the state under Tourism Sector are yet to be completed in view of shortfall of released funds as against the approvals received. The Committee of Chief Ministers on CSS had also recommended for consideration of one time financial assistance from Central Government to clear pending liabilities of sanctioned projects under PIDDC. 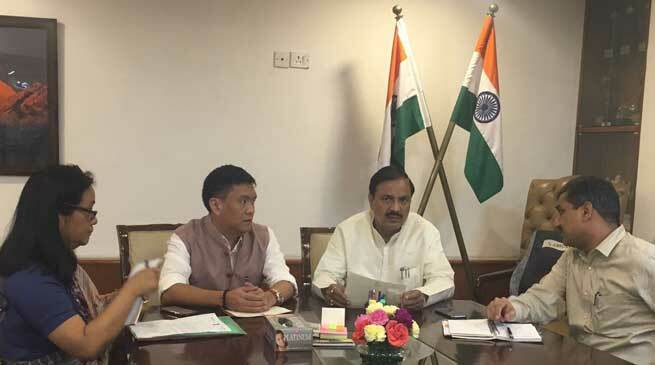 In a meeting here today with Dr Mahesh Sharma, Union Minister of State for Tourism (Independent Charge), Khandu also pitched for active collaboration with the Union Ministry in development of tourism, especially high-end and adventure tourism. While requesting the Ministry to guide the state in attracting investment in sectors like hotels, resorts, home stays and related infrastructure, he also emphasized on taking up projects to promote pilgrimage tourism at places such as Parashuram Kund, Malinithan, Tawang Monastery, etc in the state. Dr Sharma assured the visiting Chief Minister to look into the request for one-time settlement of pending releases against PIDDC Projects. He further agreed to host a tourism meet for Arunachal Pradesh in collaboration with national level tourism-related bodies to explore and tap the huge tourism potential of the state soon.